For the last several months, I’ve been hosting Show & Tell for Adults. At these events, people bring something special to show the group and then they share the story of what makes it special to them. Members of the Association of Personal Historians are hosting Show & Tell events across the country and around the world. In the past 24 hours, I’ve gained a fresh perspective on the “stuff” in my life. Travelling to Chicago from California, our flight was diverted to Denver as a result of storms which closed O’Hare Airport. Our flight was cancelled and we were stranded in Denver. The airlines held our luggage, leaving us with the clothes on our backs and whatever we carried onto the plane. 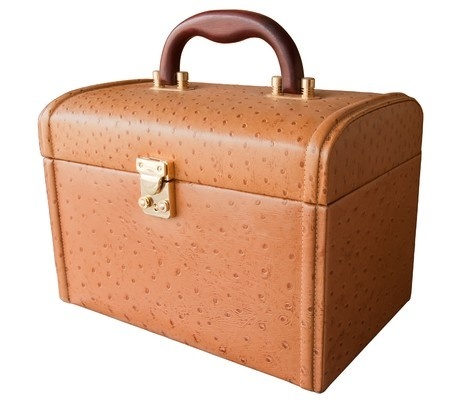 Remember the “cosmetic cases” our mothers traveled with? Today, I travel with a backpack filled with electronic gear, my laptop, tablet, Kindle, headsets, and chargers for each. Last night, I really wished I had a cosmetic case instead. I didn’t even have my purse, having tossed my wallet into my backpack for ease of travel. Arriving at the hotel room shortly before midnight, I wandered the room, missing my “stuff.” I wanted to change into my pajamas; no pajamas. I wanted to put on slippers; no slippers. Wash my face, no face wash. None of the “stuff” that makes a hotel room my home away from home. Besides the inconvenience, I missed the comfort of having my things nearby. I felt vulnerable, less confident I could handle whatever came along. We made it through the night. I got ready this morning using basic toiletries provided by the hotel. We have a flight scheduled this afternoon and should be home for dinner. Goodness knows when I’ll be reunited with my luggage! Fortunately, I’ll be comfortable and secure, surrounded by my “stuff” at home. This entry was posted in Home, Memories, Personal History, Stories, Traditions, Uncategorized. Bookmark the permalink.